Please refer to our stock # sc3 when inquiring. 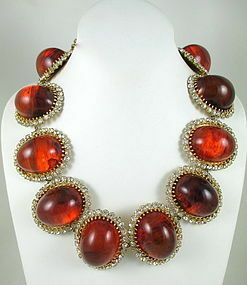 This sensational necklace by Schreiner of New York will definitely get attention when worn. It is 23 1/2" long x 2" wide and has 12 oval panels with large 27mm x 38mm high dome tortoise resin cabochons in clear stone frames. It is connected by chain on the reverse and it has a gold tone setting. There is some plating wear on a few link connections but it's only noticeable on inspection of the reverse. It is not signed but has typical Schreiner construction including the signature choke chain and dog tooth settings. It is in very good condition.